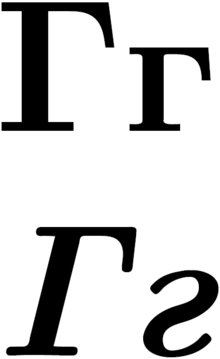 See also: r, Г, г., Ґ, ґ, Ғ, ғ, and Appendix:Variations of "g"
Cyrillic letter Г г (Г г), normal above, italics below. From early Cyrillic letter glagoli. The 4th letter of several Cyrillic alphabets. The 4th letter of the Russian Cyrillic alphabet. Its name is гэ (gɛ) and it has the sound of /g/, a hard English g as in good. The 4th letter of the Serbo-Croatian Cyrillic alphabet. Its name is г /ɡɛ/ and it has the sound of /ɡ/, a hard English g as in good. The fourth letter of the Ukrainian Cyrillic alphabet. Its name is ге /ɦɛ/ and it has the sound of /ɦ/, a voiced glottal fricative. It is preceded by В (V) and followed by Ґ (G).